To those who are in the group "save Top Gear" I would say that as a TG fan and a telly person that although it's a great thing, sooner or later they will run out of ideas and the whole thing will die a slow death. Already they are beginning to struggle to be fresh and entertaining. It will end one day - don't think that this is nasty BBC taking away what you guys like, it's more the producers running out of steam - This is why Dr Who took a year off with only 4 specials this year. In other words a campaign to save a TV programme, wether public owned or not, is futile I'm afraid. Not for the first time, Livestream baffles me somewhat. The player on the front page wasn't working earlier, yet it works now. How odd. I haven't done anything to it to make it work or not work. I've actually been in Cardiff today in a production office logging rushes, after 45hours of working in a supermarket, it's a relief to be back doing a proper job, albeit for no money! I feel as if I've got two jobs at the moment, One I like but doesn't pay me, the other I hate but it does pay me... the conundrum is that I can't get rid of the one I hate. I know I haven't actually told you where my unpaid work is yet: All in good time though. A fantastic Christmas present would be something a little bit more permanent though. So, sorry for the confusion earlier. Carry on! One of the many difficulties of writing a blog about working in the Telly industry (or attempting to) is that there's a lot that I can't tell you about until it's released. I can't really tell you about the work experience placement I'm on at the moment, and I probably can't tell you that it's with a large Cardiff based production company. Or that I've been logging cards for the last two weeks. I certainly can't tell you that my part time job in Sainsbury's is driving everyone mad because of a refit at the store, but I think I probably can get away with telling you that the shop is shut this week. Not that that makes any difference to working there. Apparently though, I can't tell you about the brand new ******* or even the new ******** because if I do, this post will probably be censored. But I can tell you that the work's very hard, it's very pressurised, and that now my knee has packed up completely, so when dressed in a leather jacket, according to mum I walk and look rather like Herr Flick of the Gestapo. My life has gone crazy. Setting that up, then also add a remembrance Sunday parade to sort out radios for, attempt to do something on the subject of air cadet motorsport, find myself making 3D models of aircraft hangers on a whim (maybe it'll come in useful? I still want one of those hangers!) and try and keep my Grandfather mobile. And I still find time to get to see a bit of Ice Hockey (first game in 3 years!). Devils were on top form last Sunday, although Belfast had the audacity to turn up 2 hours late then take the first goal! Also, I've been thinking of experimenting with 3D... suggestions for subjects please. Anyway, life is now crazy. Help! About time for an update. Even though once again I find myself heading for work in Sainsbury's over christmas I'm still trying to get into the television business. It's just that I may have to find new and interesting ways of doing it. So, Having been to a roadshow with the BBC's commissioning editor speaking, I am now working on 2 new documentary style programmes and updating R.S.T-UK with a new look and title. That's the idea anyway, hopefully someone will like them! It occurs to me that I've never actually put any services that I can offer on this site. Prehaps it's time that I did! Incidentally for any Motorsport website editors or broadcasters reading this, I have worked out how much it costs to offer a video news reporting service from all the rounds of the WRC to include interviews from mid day service, the end of day press conference, coverage of the ceremonial starts and finish, and anything else I can point a camera at. I'm amazed. I have no permanent job, and yet I find myself very busy all of a sudden. Next week I start work filming a masters Student's film in Newport (which will mean I chalk up yet another camera type onto the kit list), There's cadet projects, Graphics for Glamorgan Student Societies and a motorsport blog, a race meeting to marshal, Wales Rally GB, and the small matter of getting a job. And none of that brings me any money! oh yes, and if you look down on the right, you can see that I'm experimenting with Twitter, I have so far gained 6 Followers. I did note that some Twits(?) have a tendency of advertising, so they got blocked very quickly... the current 6 I haven't sorted through yet... there would appear to be a F1 Magazine, the BBC News Magazine (!! ), a racing driver who was at Goodwood (Hello to you, if you're reading this, hope you enjoyed the event!) and a couple of others. Something that I've been doing with the air cadets lately is doing media relations work. 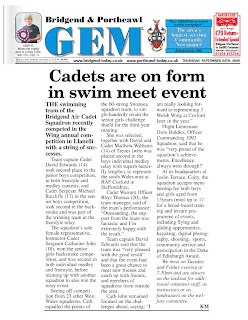 Recently I sent out a press release after a successful event for the squadron's swimming team. Here's the result! I think I'll keep an e-scrapbook! Well folks, I'm back from Goodwood. Thanks to Martin and Chris on Post 6F for a great meeting with the flags. None of us had done 6F before, and we were amazed to find it at the end of one of the aerodrome's runways. We were then surprised by an aeroplane coming in to land about 20 feet above our heads! Then to the track action. The organisers had decided it would be nice to start with a great parade of mods, rockers and police vehicles. so out come the mods on their scooters, the rockers on their motorcycles, and the police in a range of immaculate classic cars, vans and motorcycles. 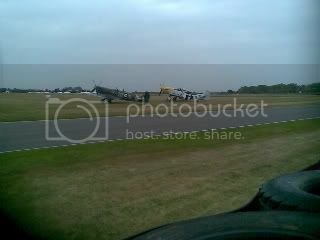 ... sorry about the quality by the way, didn't have my usual camera to hand, only my mobile phone, but you should be able to see the mods on their scooter being blown all over the place by the planes! After enjoying the first lot of practising, I took some time off to look around the circuit. In my orange hi viz kit, I felt more conspicuous than usual... it was like steeping off a flying saucer! The majority of visitors had dressed like something out of the 1960s, and with the old style advertising, cars [post 1966 vehicles are banned from the site and can be forcibly removed!] and racing, it felt like stepping back in time. Which is of course, the whole point. Sir Stirling Moss had turned 80 on Thursday, and was around the track surrounded by autograph hunters. His parade on Sunday involved lots of waved flags [in celebration, since it wasn't an actual race], a 8 gun salute from the Royal Horse Artillery, a greeting from Buzz Aldrin who had landed earlier in the day to judge the aviation concourse, the entire crowd singing happy birthday in an attempt to drown out Lord March's sister's singing, and a rendition of "Rule Britannia" in a style that I'd never heard before. And I don't particularly want to hear it again, thank you very much. I'd rather listen to the engines attached to the Vulcan, which came over and drowned everybody out, including Lord March's sister! Sir Stirling himself was every bit the British Hero, and dismissed the question of whether he might slow down a little with the answer "Well I'm only 80!" Next year, I'll be back. The Festival of Speed is already a fixture, and the revival is sure to match it. I think I'll don a period costume though. ... Well, Not sure what it is yet, but there's a lot of activity going on up there now. Prehaps someone's moved in and are producing something good...? Anyone got any information? Hurrah! The website is fixed now with the proper address... Welcome to all the visitors who couldn't get on, and I'm sorry that you had to wait so long! ... and a following wind, the site should be back up and available at the usual address very shortly. Let this tale be a lesson to all domain owners. If it's useful and you've paid for it to be in use... Then DON'T CANCEL IT UNTILL IT EXPIRES. I have now spent another £11.50 on getting this problem fixed when I could have just kept it at £4 for 2 years. To say I'm a little bit annoyed is an understatement. Never mind though. Youtubians... you'll note that How to be a racing driver is now up on the tube. Watch out for some new material, coming soon. Oh yes. Yes, I'm still here. No the domain name isn't fixed yet, and for that reason it's highly unlikely that there's anyone reading this anyway, but here goes anyway! In case you've been missing me, I've just finished the Graduate Academy course. That involved 4 weeks of work experience with Hubbub-Farsight in Cardiff. It's a great little company to be involved with and I found out lots of useful stuff, and hopefully I'll be working with them a bit more in the near future. Another group that I'll be working with a bit more is the Air Training Corps - or the Air Cadets if you prefer. This group of young people are looking for a bit of media exposure... and I'm not doing much at the moment, so put one and one together and what do you get? an opportunity. Just waiting on the nessasary forms to be processed and I can take a bit of a bigger role. I don't think you'll be seeing much ATC stuff on the site at the moment though, but I'll put a link up. Whilst not doing media stuff, I'm working on a Motorsport project, and also music as well... all fun. Other than that, I'm back into job hunting mode. If you're a member of the industry reading this, then watch your post box, as it's likely to recieve something from me soon. I'll also be updating the main site when it returns with the latest projects, although there's no new video just yet. Seems that sorting out the domain name is going to take much longer than I'd hoped. It'll be sorted soon [I hope!] then things will be back to normal. And no, I didn't get the letter I had hoped for. No trip to Abu Dahbi for me! Well, that's it for Lampeter. It's a lovely little town, although, having said that, there's not really alot here it seems. I haven't had too much time to get out and about mind. I'm typing this in my halls room on the hill overlooking the campus. It's pretty basic, but never mind that. This is my first experience of living on campus - previously I've lived at home - and I've really enjoyed it. Things are, in other words, looking up. But first, time to get home. I wonder if there's a letter from BARC inviting me to somewhere nice and hot? Right, number one, I'm in Lampter at the moment on the Go Wales Graduate Academy, and it's going well - re learning all my business studies from ages ago! The problem is that not only has my main domain name apparently now succumbed to the cancellation, but neither does the other url I have for it work! I won't be able to sort much out from here, so I'm afraid that if you're reading this, I'm sorry but getting at the main site is going to be rather tricky for a bit. Unless you've got here via the main site, in which case, this could be complete rubbish! Will be negotiating a new domain name very soon. I'm away from... well now, until the 19th of July. I may have internet access but the best way of reaching me will be via mobile phone. 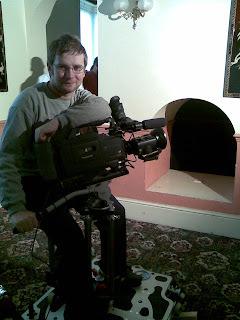 The video me and Ulrich shot for the Project Management Wales Conference 2009 is now online on the University of Glamorgan Commercial Services website. I'll be putting a copy of it up online here too as soon as I can. This may be some time! If you've got the main site bookmarked as www.kevinmcmullin-tv.co.uk, can I suggest that you change it to mcmullin.plus.com/kevin instead. I have chosen not to renew my domain name with the current supplier and will be trying to sort out the situation soon as possible, but in the meantime it won't be renewed at all. Secondly, I've sorted out mobile phone wars. They saw my point of view, and now I'm on Pay as you go again. which is great. Because now I can get rid of it at any point I like. Phew! Thirdly, I will be unavailable between the 3rd of July and the 17th of July. This is due to a) being in Goodwood for Lord March's fantastic festival of speed over the weekend, and then b) being in Lampeter for a 2 week management course. A Leicestershire 73-year-old who wowed audiences by breakdancing on Britain's Got Talent has had his benefit stopped. Fred Bowers said the allowance he received for a leg injury has been suspended while the Department for Work and Pensions (DWP) investigates. the moral of the story is that if you're doing something that you shouldn't in front of a diverse audience, don't be surprised if someone, somewhere has some kind of objection. If you do have to go all the way to London [150 miles away from home], then you may as well make a weekend of it. Turned out to be a weekend of amazing co-incidences. In case you're wondering, the interview went rather well. Don't want to reveal everything here of course. Saturday turned out to be the trooping of the colour, something that I hadn't seen before and it seemed a good chance to join in the festivities. We got a good spot in the Green Park, enjoyed the music, got a glimpse of a live Broadcast for BBC News, and turned out that we'd put ourselves right on the flight path of the Fly past! Doesn't get much better than that. This post is almost an apology for some extended inaction over the coming weeks... but I've got a lot to do! Firstly, having filmed the Project Management Wales conference for UGCS earlier in the year, I'm back at the Celtic Manor on Wednesday to film Supply Chain Wales. Hopefully you will be able to see the result on the UGCS website once it's finished. Oh yeah, whilst I remember - what was 4-10 motorsport [and is now Paul Gardner Race Tech] had a bit of a torrid time at Anglesey on the weekend with the car being destroyed in a nasty accident. Paul got out ok, but for some reason I'm glad that my camera was not fitted to the car at the time! Mobile Phone Wars, part the second. With apologies to Asp for nicking his idea of [noun] wars. A few weeks back I mentioned the vultures out after my mobile phone, as the contract is due up. Well. I've pretty much made up my mind with what to do with it, but I need to know an exact date for the contract to end with my current, very pink, phone company who shall remain nameless. But very pink. message:How can I find out when my contract is due to end? I would like to know the date when I can cancel the direct debits and make new arrangements. Thanks for you recent email, I have checked your details and can see that we can offer you some excellent offers. I am working monday to friday 11am till 7.30pm so if you want to email back a convenient time to call you to discuss further. Where exactly did I mention I was interested in any of their offers? Which I'm not. I want a phone with skype on and Pinky mobile don't sell one. There isn't a date on the contract, but if I'm right, then it runs out either this Friday, or next month, which means I'm either about to be cut off, or I've got another month to put up with this bunch of clowns. Right now, I'm just a bit on the wrong side of stressed. I have a documentary to finish [it is finished bar putting Ulrich's wonderful music to it] write several essays, and then the small business of actually finding a job. At least one which gives me money, anyway. It is therefore not a good time to be a telesales marketer selling mobile phone contract. There are about 8 companies out there all of whom are trying to sell me another new mobile contract as mine is running out soon. Like I said - Vultures. Circling my contract waiting for it to die. If you're one of them, take a hint. Don't bother ringing me because I simply won't answer you. If I do want to deal with your company then I will phone you - not the other way around. For the record I'm well aware of my contract's limited life expectancy, and I've already chosen it's replacement. Now does anyone know how soon I can get rid of the one I have now. Also it'll have Skype on it [guess the network then], which will make life much cheaper! I hate phones. I really do. When I do have to get on my bike and cycle to the station in Bridgend, I do find that I come across some interesting things. In this case [due to brake failure on the car] I come across this useful piece of advice at the end of a cycle path. 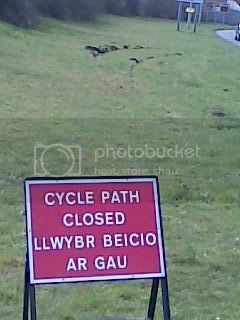 Cycle Path Closed? How about - Cycle path would be closed if it was ever built and opened? Just thought you'd like that. If you've already watched RST, then you'll know that the Autotest film is missing it's voice over. To counter this, I re-processed it and got it ready to put up onto a new dedicated RST channel on Mogulus. Trouble is that I did it in high quality, and the result is that I have a 4 gigabyte file instead of a 600 megabyte file... and the former won't fit. In short, watch this space, and also look out for a dedicated website coming soon. Also, someone pointed out that if you're not a blogspot member, you couldn't post a comment here on the blog. I'm sorry if that's stopped you before now, I have now set it so that anyone can comment and give their opinions. Mogulus is a new system for me - it's a live streaming set up, effectively gives you your own TV channel on the net. So I uploaded my showreel and a few other videos to it to see if I can get them to load quicker... I'd appreciate your feed back on it too. So either visit www.mogulus.com/kmshowreel or with any luck, use the player below. Having filmed all day at Llandow Yesterday, it came as something of a nasty surprise when I got to the interviews which I'd recorded - having set the shot up nicely, got the exposures right, Ulrich had perfected the sound, and the subject spoke brilliantly and gave great answers to our question, with lots of enthusiasm for the car we were talking about. Which one? I'm not telling you yet! Anyway, the nasty surprise. Dropouts. Lots of them, getting steadily worse. Starting at about 40 minutes in. The problem was with the recording, due to dirt on the heads, we think, and is totally unrecoverable. I can't even understand the interview to transcribe it. It's a crying shame. And the cause of this? Wierdly it's the brand of tape that I use. I have been using TDK tapes in the Z1s, and only since then have I had problems. Strangely enough the little JVC palmcorder runs the TDKs with no problems at all. It's all down to the lubrication the tape manufactuers use, or more accurately, the mixing of different lubricants from different manufactuers resulting in a sticky gunk all over the record heads. Apparently Uni have been aware of this for about a year - not that anyone thought to make a notice to us about it - and with a certain electronics supplier selling 10 packs of TDK on offer recently, the problem is now more frequent than before. In the meantime, I now have to find a way of getting a 6 minute feature from what I've got left. p.s. If anyone knows anyone who can lend me a motorcycle/motor racing driver's crash helmet for a couple of days to do a film shoot, please send them my way. It's not essential but it would be nice! Thanks in advance. Update : I went to see my lecturer in Uni, and about half an hour after I told him of the problem, there was a notice up on Blackboard [a system my uni uses] warning other people of the problem! Amazing how quickly things get done if you talk to the right person isn't it? It's not often that a day's events get to me, but today has well and truely taken the proverbial biscuit. Hurried phone calls and 2 train trips later and I've got it back again. and arrive back in uni to be told that I need not have bothered making the trip - and indeed Ulrich's talents in composing the music were in vain. Someone else had already made a title sting. Marvellous! I'll put the one which I made up online so you can see it. it's only 15 seconds long, but I like it! The one highlight of the day was running the small insert studio for a live news feed. This sounds simple, but all the VT inserts were being played in from another studio in a different part of the building - and worse, I couldn't see or hear them! It took a lot of communication and lots of saying "Cue" to make sure the presenter got his lines in on time. That went really well. Unfortunately the communication flew away for the last section - I had no idea where on the script we were because I couldn't hear or see the program, no one told me anything - untill about 10 seconds before I had to do it. The resulting effect was that the presenter was thrown into the "newsroom" which suddenly came alive, and then he found his voice! For a first attempt, not bad, but a lot of work needs doing. I hope tomorrow will be a better day. Okay, I have discovered very quickly that running a studio takes more than 2 people. In fact it takes closer to 8. Minimum. This is a bit of a problem when you've got a plan to make a TV show in a studio, and, err 2 people. Whilst I have to use current students to actually do the technical bits, which whittles down the options somewhat, the choice of presenter is a bit freer. So If you're in the Cardiff area, don't mind doing work for absolutely nothing but experience, and you want to be, or are, a TV presenter, preferably with an interest in British Motorsport, please get in touch! I can't give too many details about the program away. Well more accurately I won't give too many details away. It's mine, and I'd like to keep it that way, so I'll use my favourite phrase. For anyone who tried to log on earlier this week, and found the main site down, then I'm very sorry to hear about the problems. I've tracked the problem down to Plus Net who had some server difficulties on Sunday and Monday, so the blackout was probably caused by one of them. Do not adjust your brain, normal service has now been resumed. I hope. The results of the Time Lapse Experiment. I think with hindsight, The concept of timelapse is sound, but could do with a bit more work - for a start making sure the computer doesn't shut off [hence why there's a big of a jump in time]. Rather more alarming, the car moves after it's been parked. I didn't move it, so why did it move... somewhat unnerving. I had thought about getting the dogcam out for a snowy drive, but all the snow has gone now, so I can't. Tuesday was the most snow we've had for some time, certainly. you've probably seen it on the news, and if you're one of my European based friends, had a good laugh at how pathetic we Brits are when it comes to snow. It was probably the daftest thing I've ever done, but I chose to go into uni for my weekly Studio session. Well one of them anyway. I do enjoy these sessions. Studio work up till now has definately been lacking from my life - and I seem to be settling into two distinct roles. Sound mixing and floor managing [haven't done vision mixing yet though]. We'd got the set and lighting planned, the script was being written, and then Andy our lecturer walks in and explains it's snowing quite heavily, so if any of us had to go any great distance, it might be an idea to go now. I call home, and yes, it's snowing quite heavily. Best to head back then. 30 minutes after I left, Uni was closed, so I missed nothing. about 5 minutes before I arrived back [surviving a slightly slippery moment on a nearby roundabout] It stopped snowing completely, and about 10 minutes afterwards me and Dad went for a lovely walk in the sunshine. I even had my sunglasses out! They do say there'll be more snow on Thursday. I'm not missing Friday's studio session for anything! Last week we had a mock Police news conference. Which went from our technical view, very well indeed. Well other than one of hte 2 radio boom microphones dying on us, and the talkback system failing. The Journos also enjoyed it. finding holes in the police students stories, picking at them, hammering wedges into them, then going for the kill. I don't have any video to show you, but suffice to say my music technology degree is working wonders. People listen to me when I say what needs to happen on the sound. Joy. Oh yes, and I'm still blanking out those number plates. What with it being snowing and all that, ['s funny, it's just stopped] I'm trying out something a bit new. Time Lapse. I've got a software called Gawker, and I'm trying to get it to take a photo every 5 minutes so I can strng them together afterwards. I wonder what will happen...? In case you're wondering, I'm still editing all those number plates from last week! And I've had a press conference in the TV studio at Uni, which went well. I also appear to have found that sound mixing and floor managing are roles that seem to suit me. Wonder why. The results of the time lapse will follow. Sunday was a fun day's filming. 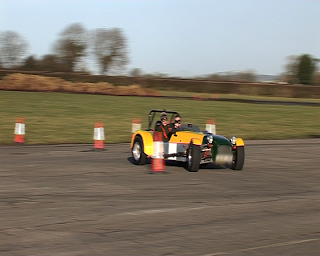 As part of a series for Wheelnuts on the lesser known motorsports, I spent the day at Llandow filming the Bridgend Automobile Club's Autotest event. The filming itself went very well indeed. and after lots of editing [most of which completed by Sunday evening] I recorded and added the voice over to it on Monday, and it should be up later on Today. Probably in the early hours of Wednesday. A big thanks to Dean, Tom, Chris and Tony for helping out with participating in the filming by the way! 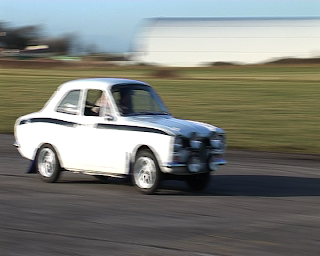 A new skill I managed to pick up in the edit is that of being able to blank out number plates, or indeed anything. It's somewhat time consuming, but the effect looks good, and is certainly not that bad for a first go. Until the video arrives then, here's a pair of screenshots. You'll get the good stuff soon, honest! Well. Two new videos are now online - keeping me up untill 6am in the process. The Ducks - which you can view Here are also watchable in HD format. Which is nice. Sadly the sound on the other video was removed by Youtube because of a copyright problem, so I shall have to find a replacement for it. I'll update the "New Videos" page soon to reflect the change in videos on there. Amazing what little gems you can find on the internet isn't it? BBC News are reporting that tomorrow is the most depressing day of the year. That figures, I feel very depressed already! The Optimists' Society say they want to reclaim the "most depressing day of the year" as International Optimism Day. This year "Blue Monday" - a date in January regarded as the most depressing day of the year - falls on 19 January. The Society will send cheer packages to celebrities such as Jeremy Paxman, and will host a free comedy show in London. And good on them for doing so. Besides if anyone can find a way of cheering up Paxman, then they are on to a winner and why didn't they do it years ago. 17 views already! I wonder how many of them were me? Couple of problems which I've noticed. Some of the links for some reason don't work on the Documentary page and the Acreddited media page ... well all of them don't work in fact. That will be sorted with the next update, along with a RSS Feed from this blog on the home page, and a few other new things. Like a proper links page. I found this story on the BBC News page today.... and it doesn't make for nice reading when you are, like me, trying to get into the media and live in Wales. Mr Davies [MP for Blaenau Gwent] said: "We have seen a haemorrhaging of media jobs at ITV Wales, at Trinity Mirror, with Northcliffe papers, in commercial radio. "Wales is becoming a media wasteland in which only the publicly subsidised BBC and S4C seem secure. This is very, very worrying for democracy. It's interesting that the article also says that BBC Wales is in a program of job cuts, especially when I have a job application form for a job at the BBC in Wales on my desk in front of me! Still, I get the feeling that it's going to get even harder to get a job in an industry where it was already hard to get a job. Interesting times indeed. Changes are afoot, dear friends. For a start, there's a shiny new blog - available at kevinmcmullintv.blogspot.com - unless you're reading this there... in which case Hello! you've found it. Secondly, there's a new site in the works. More videos, and a brand new layout, and a brand new home. I hope it will be a big improvement. I don't intend to get rid of my freewebs site just yet though, so you can keep looking at it. In other words, watch this space.